Of approximately 3,000 survey participants, 24 percent said they prefer getting an animal from a breeder over adopting from a rescue or shelter. Almost 3,000 people who live with cats and dogs participated in PetSmart Charities’ 2014 Shelter Pet survey. Among the findings, 81 percent of those surveyed said they own a dog and/or a cat. That percent is significantly higher from just three years ago, when it was 63 percent. 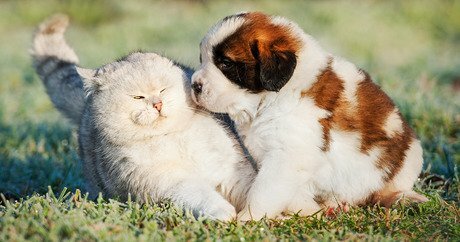 Another 40 percent of respondents said they have donated time or money to support shelter cats and dogs. That number jumped up 29 percent, from three years ago. Animal shelter workers were pleased to learn that 86 percent of cats and dogs have been fixed, compared to 79 percent in 2011 and 80 percent in 2009. (Almost half of those were spayed or neutered after their new owners got them.) And more U.S. households have dogs than children. Other numbers remain troublesome, however. Nearly 24 percent said they still prefer getting an animal from non-adoption sources, such as breeders, over shelters or rescue groups. Thirty-four percent of those who added a pet in the previous 12 months but chose not to adopt said they went elsewhere because shelters do not have purebred animals (not true). And 12 percent of those who chose not to adopt said they didn’t know much about pet adoption. Less than half of pet owners knew that low-cost spay/neuter options were available. That’s a problem because 30 percent of people whose pets were unaltered said they chose not to spay or neuter them because it was too expensive. Many surveyed had no idea how many cats and dogs are euthanized in the U.S. So there is room for education, which PetSmart Charities tries to do, along with encouraging adoptions. The problems persist, but there is hope. The report is based on a survey of 2,800 adults — pet owners and non-owners alike — conducted in July by research firm Ipsos MarketQuest. The full report is available at PetSmart Charities.